Depression affects 1 in 6 men…Most don’t seek help. Untreated depression is a leading risk factor for suicide. Last year in Australia 18,700 men were diagnosed with prostate cancer and more than 2,900 died of prostate cancer – equivalent to the number of women who die from breast cancer annually. 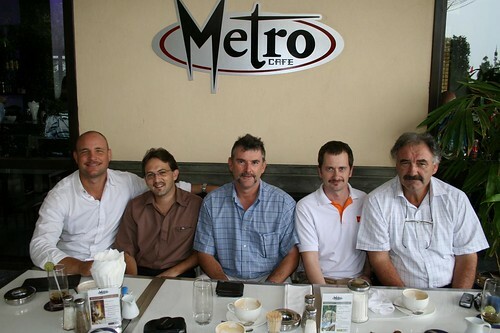 It is coming to the end of MOvember and team CaModia would like to go out with a bang. We have already raised around $1000 but we would like to add to this in these last days. We have organized a party at ‘Talking to A Stranger’ 6pm Saturday 1st Dec to show off our well groomed Mo’s. Then at 7pm there will be a shave off where all Mo’s will end up on the floor. Young Stuart Elaisson has also offered to open up the ‘Pash’ booth for all those ladies wishing to find out what a real man feels like. Please come along, have some fun and sponsor a very good cause; all money raised on the night will go to ‘Healthnet TPO’ which deals with such issues as depression in Cambodia. If you cannot make the event then you can either pass on sponsorship to one of the member of team CaMOdia (listed below), or you can go online and sponsor directly through the Movember site (details below), even the smallest donations help. enter our registration number which is 102714 and your credit card details.